If your Mac OS X desktop quickly turns into a cluttered mess of files and folders while you work, you’re not alone. The busier (or less organized) you are, the quicker this accumulates, until finally the Finder is so covered in files that you can barely see the wallpaper. Sometimes mine gets so full that I just hide the desktop icons so I can deal with them later, but that’s not necessarily the best solution. 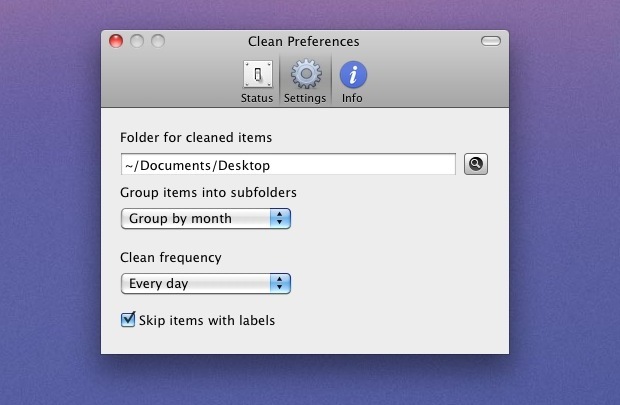 This is where Clean steps in, the free app automatically moves files from your desktop to a specified location, which are then grouped by day or month. You can set it to run once a day or once a week, or you can force it to run at any time just by clicking the “Clean now” button. What if you have a really important file or folder sitting on your dekstop? Give it a Finder label and set Clean to ignore labels, it’ll stay there while the rest are swept away into your previously chosen destination. A great use case is to create an alias to the folder that you are sending all the desktop files to, and give that folder a label so it stays put, that way you can quickly access all your organized and tidied up files directly from the desktop. Clean is a simple timesaving app that is a must have for anyone who fears desktop clutter, plus it’s free, highly recommended. Not to get off topic, but isn’t there a way to hide and show the desktop constantly without using the defaults terminal all the time? There was an app to do this right? It lets you hide and show the desktop, as well as invisible files and a few other functions, from the menu bar. Seems worth a try. I use spotlight to find the files i want so I really don’t care where they are to an extent. i’m thinking as long as they are in the documents folder then i’m good. Camouflage hides desktop clutter. Or really –> pulls the background image forward. I appreciate the freeware, but the idea isn’t actually intuitive. You see, the entire point of the desktop is to keep fairly critical things handy. All downloads on my Mac typically hit the desktop first as my grand central. What CLEAN is accidentally doing is maybe tucking away something you need with a lot of crap you don’t. I know, there’s a workaround with labels, but then that defeats the point of CLEAN. An app that would be useful is a quick way to file stuff that’s on the desktop, since the Finder BLOWS at this. An IT friend told me, that one should always keep your Desktop as clean as possible, because it is ‘always active’ in the background the more/& larger the file = slower performance. There is some truth to that in each desktop file or icon takes up memory and requires the screen to redraw each time the desktop is shown. 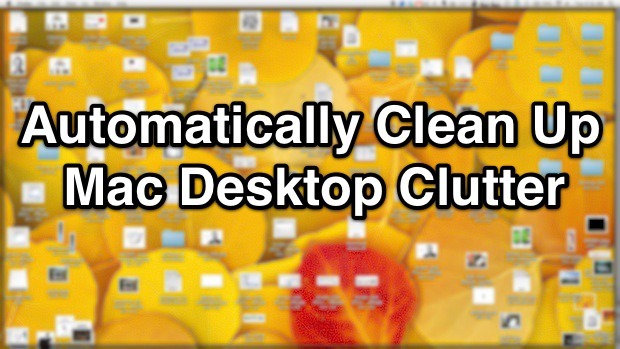 It’s good practice to keep the desktop clean, regardless. What I did what just make a file and I named it Desktop and put all the files from my Desktop and put them in the file and put the file in Documents. Then when I download a file to my desktop, at the end of the day I just move the files to that folder and keep the ones I really need on my Desktop. I check my desktop everyday and do this to keep on top of things. Do you know where the short-cuts/icons/doc(s), etc on the desk top goes. I need to put some of them back. Thank you in advance for your help. « Will the iPhone Always Have a 3.5″ Screen?